The barn used to house the produce business is actually a converted tobacco barn. All of the Gross siblings worked in tobacco while growing up and vividly remember filling this barn on numerous occasions. In the spring of 2000, the strawberry field was planted and a shelter was added to each side of the former tobacco barn. 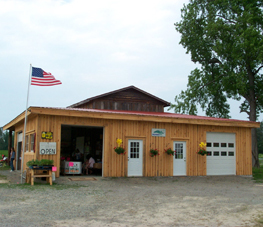 Produce grown at Gross Farms was made available to the public for the first time. Since then, thousands have enjoyed picking their own juicy strawberries and other vegetables from the rows of healthy vines.